Located on Main Street right near McDonough Street, Old Millstream Inn Restaurant and Beer Garden provides hearty American pub fare in a casual, rustic setting, including a heavily stocked outdoor beer garden. Patrons can enjoy the scenic waterfall rolling on while sitting in the outdoor patio or head inside for a cozy meal. The restaurant reopened in 2008 after a fire, but the kitchen is going again with a selection of appetizers, salads, sandwiches and entrées. Starters include cold artichoke dip with pita chips, crab cakes and mill fries - fried and seasoned whole potatoes, which are also served with each sandwich. 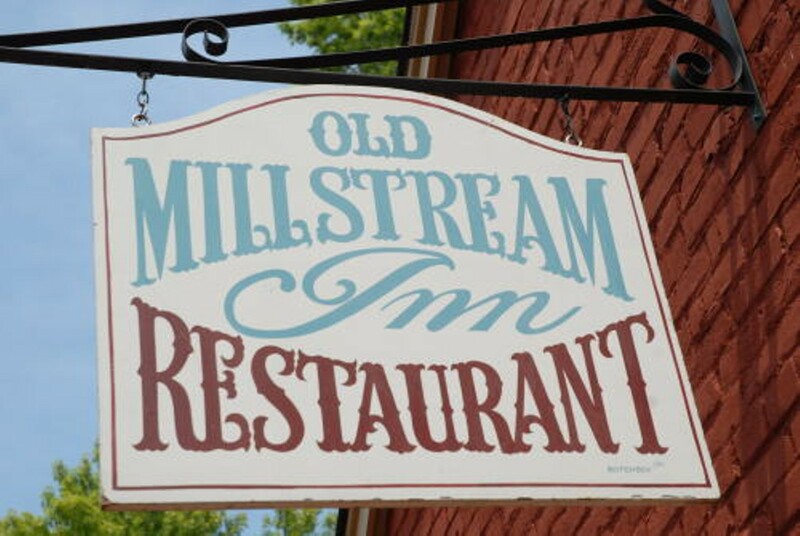 Old Millstream serves up a number of different sandwiches, such as a beef dip with Swiss on a hoagie with a side of au jus, and a chicken salad sandwich served on hearty wheatberry bread. Entrées, served after 5 p.m., include a grilled Atlantic salmon and a Gouda-stuffed pork loin, both served with rice and veggies. The restaurant also offers a changing dessert menu of various homemade sweets. Beneath the restaurant, patrons can find the Old Millstream's beer cooler, where they will find 100 different bottled beers in stock and ready to serve.